Click Here for Instant Savings on this Product. 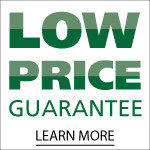 Call (800) 794-9813 to learn more about our special offers. *Non-Contiguous U.S. States & Territories - please call for shipping charges. 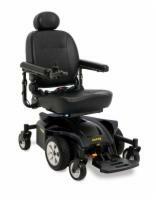 The Jazzy Select 6Â® 2.0 offers a truly unique ride experience with a sporty design and superior performance. 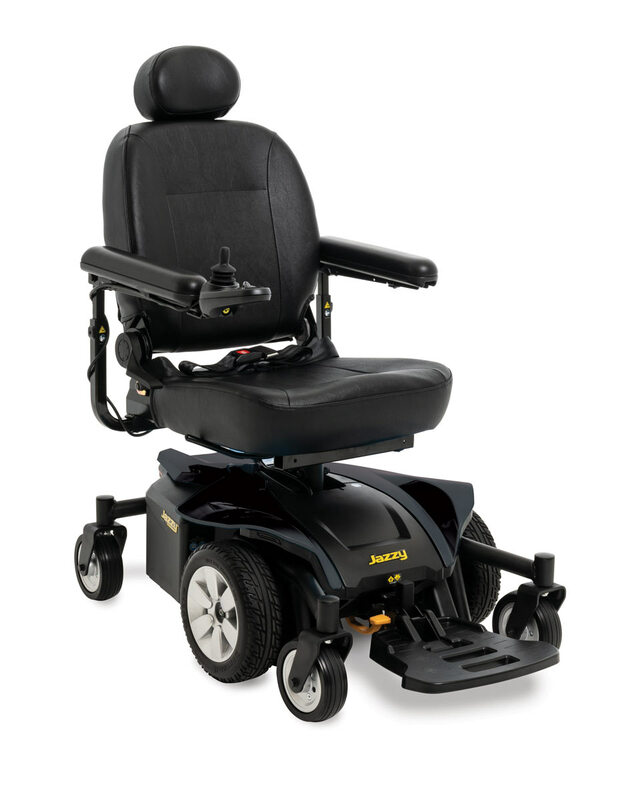 Prideâs patented Active-TracÂ® Suspension combines with Mid-Wheel 6Â® drive design for a smooth, comfortable and stable ride, both indoors and out. 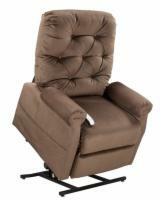 The depth-adjustable high-back seat folds flat for greater convenience, while offering maximum comfort and support. 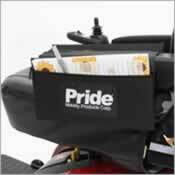 Convenient, high-back folding seat is depth adjustable for maximum comfort and includes replaceable back and seat covers available in sizes: 16" x 16"-18", 18" x 18"-20" and 20" x 18"-20"
Not compatible with the Power Elevating Seat option. The controller and the cup holder cannot be located on the same side. Seat Width: Measure the widest point of your body between the knees and hips. Add at least one inch- to this measurement for some extra breathing room. If you typically wear bulky or heavy clothing, such as during outdoor use in winter, you may wish to add two inches to this measurement to give yourself adequate room to move. 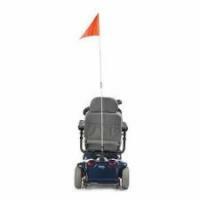 Back Height: This measurement will determine the distance from the seat base to the top of the wheelchair's seat back. Typically, you'll want to measure from the most posterior point of your body to the center point between your shoulder blades. Some users may prefer a higher back for added support, but remember that the higher the back of the chair is, the less room you'll have to rotate your upper body while seated. Front Seat to Floor: Measure your leg from the back of your knee to the sole of your foot. 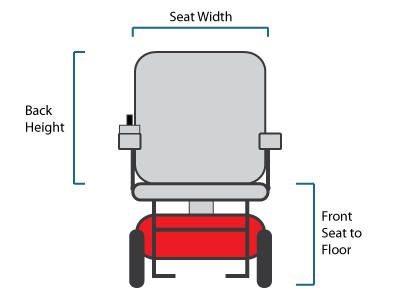 Unless you are choosing a foot-propelled wheelchair, you will want to add two inches to this measurement to give yourself plenty of clearance for a footrest. Seat Depth: Measure from the most posterior point of your body to the interior of your knee, deducting two inches from the total. You may require a greater amount of leg overhang to lift your legs during use; if so, consult your rehabilitation professional for guidance on adjusting your measurements accordingly, or speak with one of our power wheelchair specialists by dialing 1 (800) 794-9813 to get the right fit. Hanger Angle: This measurement specifies how far your toes will extend from your body when seated, and is measured horizontally. The tighter your hanger angle, the less space you'll need to turn your wheelchair around. The flexibility of your legs and knees may also impact the hanger angle you will want to choose. Most wheelchairs have a hanger angle of about 70 degrees, and the farthest hanger angle available on any wheelchair is 60 degrees. Pediatric chairs have a hanger angle of 90 degrees to accommodate the shorter leg length of child users. 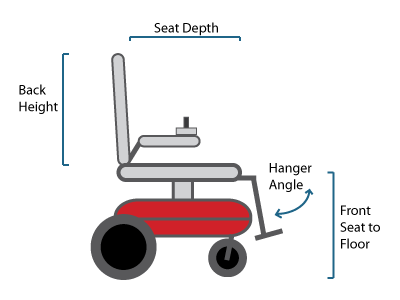 A hanger angle is difficult for a wheelchair user to measure on their own, so we highly recommend calling one of our power wheelchair experts at 1 (800) 794-9813 to help you find a chair with the optimal hanger angle for your needs.